So Many Automotive Floor Mats from Intro-Tech. There Has to Be One for You! OK, so you never knew that carpeted automotive floor mats made by Intro-Tech were so popular, huh? Well neither did I! The company has been around since 1991 quietly manufacturing custom car mats in Southern, California from a wide variety of materials acquired from around the world. Their Carpeted Mat Product Line includes such styles as; the Super Plush Auto Mat, the Designer Auto Mat, the Berber Auto Mat, the Oriental Auto Mat, the Safari Auto Mat, the Fashion Auto Mat, the Rhino Auto Mat and the Spaghetti Auto Mat. 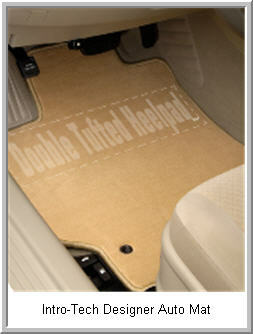 Besides the front seat mats, Intro-Tech makes rear seat and cargo mats to finish the redecoration of your vehicle. Important Note: The Super Plush, Designer, Berber, Oriental, Safari, Fashion and Rhino AutoMats are currently made and distributed by Designer Mat International, a company closely associated with IntroTech. Most of the info on this page is up to ate but see our Designer Mat International page for any updated info. If you’re interested in some unusual and exotic automotive floor mats, say, maybe, a Leather Car Mat, a Sisal Mat, a Coconut Husk Mat or a Diamond Plate Mat then check out our main Intro-Tech info page. You'll find some info on each of these Intro-Tech Car Mat styles that complement their carpeted car mat line. But I’m off topic again. 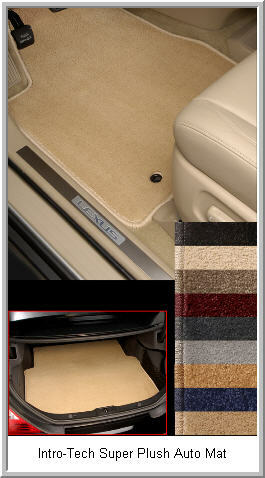 On this page I want to tell you about 8 different types of carpeted automotive floor mats manufactured by Intro-Tech. Please Note : These mats are intended to replace your existing car floor mats. Do not place them on top of your existing mats. Remove your existing mats before installing your new Intro-Tech Mats. If necessary you can help protect your new, valuable IntroTech mats with a set of universal absorbent car and truck floor mat protectors. The Super Plush Mat is the flagship of carpeted automotive floor mats from Intro-Tech. It’s made from 54 oz. twisted nylon yarn, so densely packed, it’s hard to push your fingers through it. 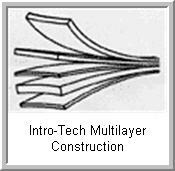 A multilayered construction provides stiffness and water resistance. You get your choice of a rubber nib or “open cell foam” backing. If your vehicle is equipped with mechanical anchor posts from the factory, you’ll be pleased to know the Super Plush can have grommet(s) strategically inserted to use them. These mats come in 9 colorfast colors so you can clean ‘em up with soap and water. For all of us who need our initials on everything Intro-Tech will custom embroider the mat – you pick from 100+ colors. 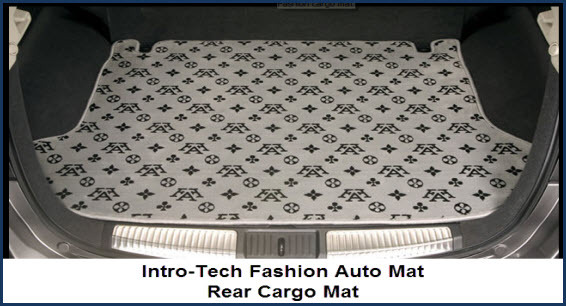 The Designer Auto Mat is one of the industries most popular and well known automotive floor mats. It’s made from 1/2" thisk, 32 oz. polypropylene carpeting with a built in double thick heel pad aptly named "Double Tuff". You won’t wear this mat out itching the back of your heel! Like the Super Plush, the Designer Auto Mat is of multilayered construction with your choice of rubber nib or “open cell foam” backing and may use strategically placed grommet(s) to anchor the mats to your factory floor anchor posts. You can pick from over 20 colors that you cleanup with soap and water. I like Berber style carpeting because it wears really good and has those little flecks of color running through it. So if I drop a bunch of crumbs from the croissant I had with my coffee, in the car, nobody can tell. So, Intro-Tech really helps me out here. 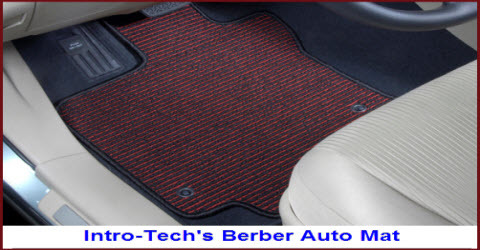 Their Berber Auto Mat is made from a looped polypropylene yarn that's woven into a tight pile to provide excellent wear resistance, a great look and floor protection for your vehicle. Intro-Tech research made possible the padded rubber nib backing that prevents these mats from slipping on the car floor. The Orient has always conjured exotic imagery in our brains. And now you can bring that far away, mysterious feeling to your car, pickup or SUV. Intro-Tech's Oriental Auto Mat is a 114 oz. polypropylene carpet, custom cut to fit your vehicle precisely, that comes in 3 exotic Oriental designs; Black Herati, Red Sultan and Multi Color Gul. With a set of these mats all you provide is the silk pajamas for your significant other and you can make a night of it in your vehicle. Need a vacation but you can't afford that African Safari you always wanted to go on? Afraid that PETA (People for the Ethical Treatment of Animals) will discover those Leopard and Tiger skins you're using for car floor mats and boycott your vehicle? Well you can have your cake and eat it too with the Safari Auto Mats from Intro-Tech Automotive. These mats come in 2 jungle cat patterns - Tiger and Leopard. You get all the great Intro-Tech features and luxury and you don't feel guilty because, Hey!, these mats are made from 114 ounce polypropylene that's woven into jungle cat patterns. 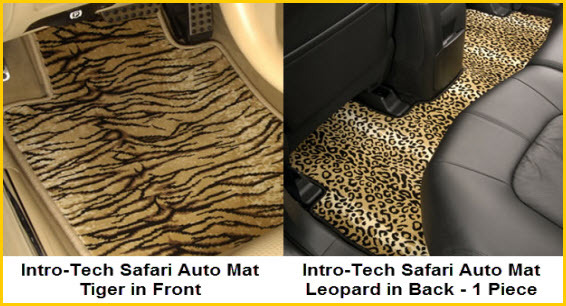 And you can put a Tiger in the front and a Leopard in the back seat with the available 1 piece rear floor mat! The Fashion Auto Mat reminds me of the eloquent, rich looking carpet I see when I visit old Victorian mansions. These automotive floor mats would work extremely well in a more expensive import with leather seats and trim. But, heck, I may to feel like a million bucks and put it in my Kia Sorrento! The Fashion Auto Mat is made from Intro-Tech's 114 ounce plush poly carpet and has all the standard niceties you get from Intro-Tech. The Rhino Auto Mat has the coolest logo of all the Intro-Tech products, that is, if you like things with 3 horns. This mat is made from a needle punched synthetic fibrous material imported from Holland and custom cut and finished just for you by Intro-Tech in California. It’s horizontally grooved, kinda like they do to highways when they want you to wake up! The grooves in the Rhino Mat trap liquids and dirt channeling them away from your shoes. The edges of this mat are serged and a vinyl heel mat protects from wear through. This mat is the choice for dirty use in SUV’s, trucks and vans. Just like the other Intro-tech custom mats you get to pick a rubber nib or “open cell foam” backing and may be grommeted if your vehicle has anchor posts. Put this mat in a pot of water, boil for 10 minutes, drain and serve with your favorite pasta sauce - NOT! While this mat's carpet resembles a really bad tangle of spaghetti you can't cook and eat it. But it is very useful if you want to trap dirt and dust in your car. The "spaghetti" strands in the carpets are designed specifically to trap dry nasties like dirt, sand and other gritty stuff you drag into your vehicle on your boots, shoes or bare feet (maybe some beach sand between your toes?). Carpeting made from 5/8" thick high impact PVC woven in a design that traps dust, dirt, sand, etc.